I’ve been intrigued by the Lord of the Rings game that FFG have had out and now they are planning another coop LCG I can actually get in on at the start. I’m a massive fan of Netrunner and the video that Team Covenant put out of the demo only served to peak my interest further. Definitely one for the christmas list as it releases in quarter 4, probably. Despite coming with a hefty price tag the app integration in this looks really neat. One of the issues with the first game was the unwieldy setup and it sounds like the app eliminates a lot of that straight off the bat. It’s really gratifying to see a company like FFG experimenting in this way and really pushing at the boundaries of what a Tabletop game can be. FFG breaking into the last big arena they don’t really have a share of, yet. This could be really interesting and I have seen plenty of rumours floating around that it may also signal the end of their relationship with GW. Not totally convinced by that as I think it does GW a lot of good to have their IP reach a wider market, but I guess we will just have to wait and see. Don’t know much about this other than it seems to be about a pub brawl in a fantasy tavern with robo rally like mechanics. The components look gorgeous though and if it can replicate the fun and chaos of Robo Rally that would be ace. My excellent friend Gregor Hutton has snaffled one of these for me as you can’t get it in Europe at the moment due to some strange licensing shenanigans. Never played one of the panic games but this just looked a bit too awesome to resist. Might be one of those games my wife will play with me as well as she is a massive star trek fan! First impressions when I get it to the table. I love the idea of the legacy games but my group were less than enthused by the Risk and Pandemic reskin. A game built from the ground up sounds ideal and I’ll be eagerly absorbing reviews of this until it hits these shores. Yes back to FFG, but you have to admit they are on fire at the moment. A massive sprawling board game specifically designed with a high player count in mind rather than adding expansions to accommodate those players! Count me in! That and the fact that it is set in the Netrunner universe. Not heard much about this at Gencon but is from the same designer as Suburbia which is a personal favourite of mine. I really love games that involve building something up from the ground and Suburbia has always been fun for the little stories that emerge as you play, Looking forward to it releasing soon and giving it a shot. 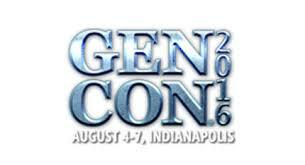 There are loads of games on their way now that Gencon has been and gone and Essen is just round the corner. It’s hard to see the smaller games from this distanceI’ll do another on of these after that show and I’ll be sure to write up a review of these as I get to play them.